After all the changes at my school, we have been reusing some "older computers" to fit different needs. There are some pieces of technology that we are abandoning: no more mechanical mice (students like to take out the little roller balls) and no more single-button mice. We have also disposed of any Mac that doesn't have FireWire. 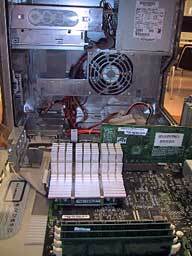 With FireWire, PowerPC Macs can use FireWire Target Disc Mode and use an external drive to boot the computer. That is our current line in the sand. 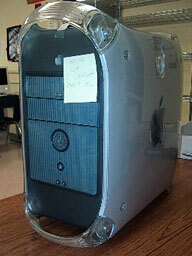 However, we did have some G4 towers left over from a keyboarding class. 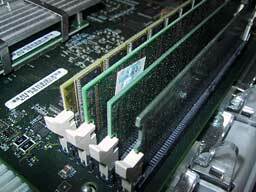 Most of these venerable warriors,"Sawtooth" Power Macs from 1999, had been running Mac OS X 10.3.9 and had little over 256 MB in RAM plus 10 GB hard drives. The science classroom we were sending them to needed a little bit more modern operating system and larger hard drives. 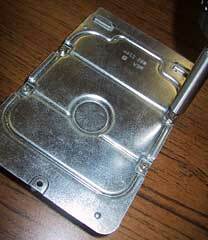 I got to pop the old G4s open and remove the hard drives. This was on top of my other duties. This is what the old gal looks like when it's open. 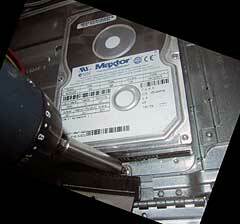 The 3.5" hard drive is located near the rear on the bottom of the unit (behind the green video card). 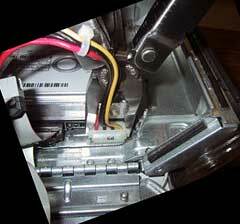 I like to place a pair of pliers on the plastic housing for the power cable leading into the hard drive. I gently grip the white plastic and gently rock it back and forth. I then "worry" the plug out. 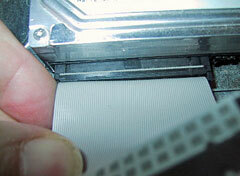 The gray ribbon data cable is best removed by gripping the black plug and wiggling it out of the hard drive. I know it can be done, but I do not recommend pulling them out by their cables as its possible wires will pull lose. 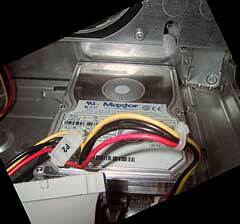 After these cables are unplugged, you need to remove the one screw that frees the hard drive sled from the computer. Then you unscrew the sled from the hard drive. When you're are all done removing the hard drive, you can put its replacement in the drive sled and reverse the process. I don't assume any liability for your own repairs on your own computer. Neither does Low End Mac. I highly recommend searching the Internet for more detailed instructions, but as you can see from my photos, these computers are very simple to access and work on. After that, the towers will be equipped with monitors, mice, and keyboards, then be placed in a science lab. There the G4s will continue to live happy and productive lives. There is still a great deal of life in a computer so old that would have been discarded in the PC world.